Resume for O-Level students and A-Level Students. 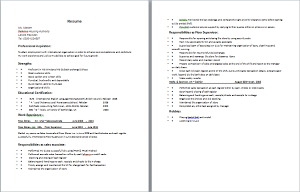 This resume is taken from the student of Cambridge University and work experience in the United States. 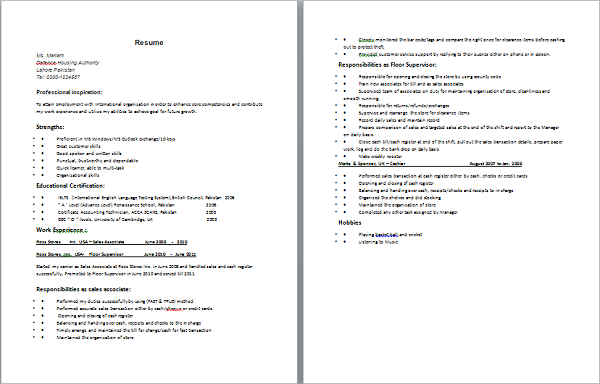 Sample Resume with Experience of Floor Supervisor, Sales Associate and Cashier available for free download. To attain employment with International organization in order to enhance core competencies and contribute my work experience and utilize my abilities to achieve goal for future growth. · Performed accurate sales transaction either by cash/cheque or credit cards. · Closely monitored the bar code/tags and compare the right price for clearance items before cashing out to protect theft. · Provided customer service support by replying to their queries either on phone or in person. · Supervised team of associates on duty for maintaining organization of store, cleanliness and smooth running. · Prepare comparison of sales and targeted sales at the end of the shift and report to the Manager on daily basis.